For yet another variation on "Race to 100," try playing it in the bucket balance with Numicon shapes. Two players take turns rolling two dice. 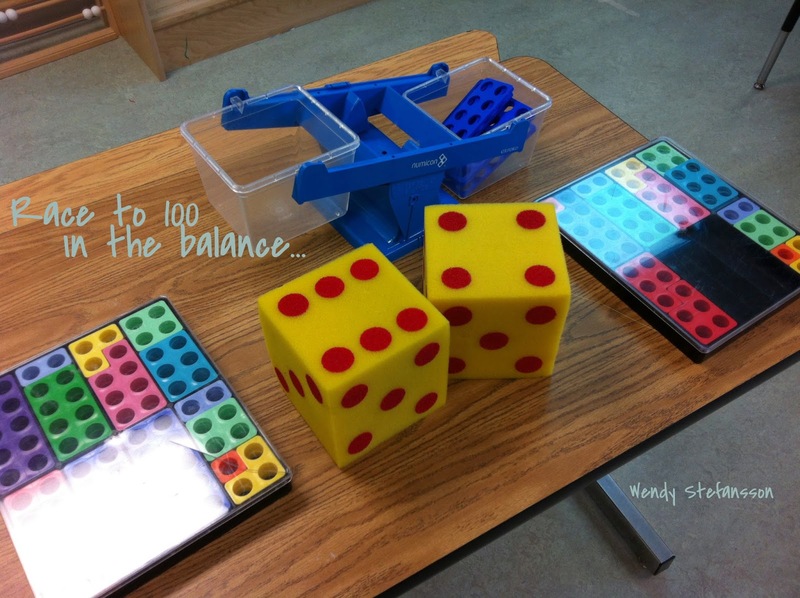 They add up the number of dots, select that number in terms of the Numicon pieces, and put it in one side of the balance scale. The other side always has ten tens in it, and the players don't touch it. Play alternates until one of the players plays the piece that balances the scale, or achieves 100. If they go over 100 -- they will know because the balance will tip down -- the last piece must be removed and the other player gets a turn. Play continues until the scale balances. After racing successfully to 100, play "Race Back to Zero" using the same rules, but taking number pieces out of the bucket until it is empty again.